When I discovered that the movie was based on a book of the same title , written by the Reverend Albert Fay Hill and published in 1968, I was very eager to read it. (You can see the complete list of books Disney films are based on by clicking the link.) Being that this was a favorite story-on-screen for me, I happily found a used copy and set the book aside to read for some fun and entertainment. I've had the book sitting on my shelf and finally I pulled it down to read - only to be a bit disappointed with it. For starters though, I should point out the fact that the book is based on some factual events "to rid New York's Westchester County and the City of Rochelle of Organized Crime." Author Rev. 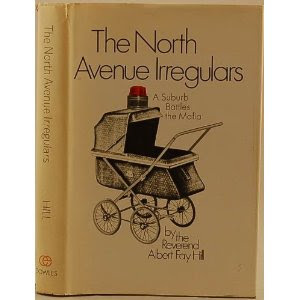 Hill explains in his introduction that although the book has been generally fictionalized to protect the names of those who need protecting, it is based on real and true events that involved a group which called themselves North Avenue Irregulars. This group of Irregulars were comprised of members of The North Avenue Presbyterian Church and they are the group of people to whom this book was dedicated. The story-line is basically the same in the book as in the movie which I love so well. However, I don't think I would have even begun to be able to understand it having not having watched the movie. Author Reverend Hill's writing style is kind of chaotic. He likes action scenes and opens the book with one, but doesn't explain the characters and fails to paint a background to what is going on. It's confusing. I knew what was happening only because Disney smoothed out these wrinkles and kinks and helped cause the story to flow, making more sense. I had mental images and pictures of what was going on in my head. Of course, there are some notable differences in the book. For one, Reverend Hill is still married in the original story, although his wife is battling cancer. On the screen, he is a widower with two children making him a more likely target for a romance which, of course, occurs. I cannot, however, inform you of whether or not he becomes a widower in the book because I couldn't finish it. In the book The North Avenue Irregulars are absolutely fighting against Organized Crime. They also deal with issues of prostitution and the Reverend Hill doesn't shy away from using some foul language in telling his tale. I think this is one of those instances where I prefer the Disney-fied version of the movie and just didn't feel as if I wanted to spend more time with the book. I should note however that I appreciate the movie all the more knowing that it was based on actual events and not just a work of fiction! The other thing I struggled with concerning the book was the cockiness of Reverend Hill. His presentation is a bit to prideful in nature and it made it harder to swallow. That said, he also argues his point for why a minister ought to involve himself in the community and fight against illegality and injustices. I marked several passages in the first half of the book where he argues a need for firm statements and truth. "You should be doing positive, kindly things, helping people, not being so negative." "As Jesus was so positive and kind with the money changers in the temple?" I stopped mid-way in the book, as I said, because of the language used and the additional aspect of prostitution which just didn't sit well with me. I wanted to read it because I love the characters in the movie so very much. I love that the women are portrayed on screen as home-making bulldogs. None of the women give up their responsibilities at home (although they are tried and tested to do so!) but are fighting for a cause. They are the least likely suspects to be spies, as I mentioned. They have these hilarious dialogues between one another and, of course, care about things like hair and nails. It is just amusing how this rag-tag group of Irregulars bring down these criminals! So, maybe it would be considered a bit shallow of me to say I like the movie over the book for its cleanliness and light heartedness. At the same time, the story on screen (adapted and told by Don Tait) flows much easier, making it easy to comprehend, whereas the book reads like a hodgepodge of car chases, conversations and courtroom testimony which is much harder to follow. I highly recommend the movie. The book? Well, not so much. It's not bad. It's just poorly told and definitely lacks in humor - which is what I was after this time. As a reward for reading the book, I purchased a copy of the movie The North Avenue Irregulars so that my own family can enjoy it. I think perhaps instead of a "reward" it has just become a fun treat -- which I am totally ok with! 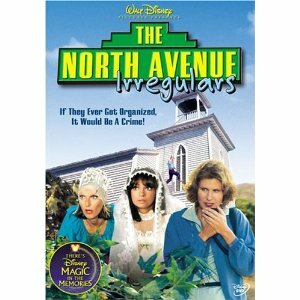 I had NO idea The North Avenue Irregulars movie was based on a book - that is very interesting to know! Thanks for the review! Great information about the book!!! I love(d) the movie so much I replaced my VHS version with a DVD!!! I had never heard of this, book or movie, and I thought I knew most of the Disney movies! Oh, Barbara H. - I think you would really enjoy the movie! I can not believe I had forgotten ALL ABOUT this movie and actually the title didn't even ring a bell until I saw the image you posted. Yes, one of our favorites growing up! Loved it as a girl (much older than you but still a girl nonetheless)! Thanks for the blast from the past! I am familiar with both the movie (also a favorite in my family) AND the book . . .AND Rev. Hill. My father was also a pastor in that town at the time, and I was a little girl in the early '60's. I remember my father participating in Reverend Hill's efforts (he is mentioned in the book a few times), and I remember being followed home from school by dangerous men because of my father's involvement. While I agree that Hill's book is not literary genius, it is an important book nonetheless (perhaps better told by another author). We have all met people who are bulldogs with their passion, and their fervor comes off as conceit, while, really, they are single-minded in the pursuit. This is not to "scold", only to speak a word on behalf of someone who walked the talk. Additionally, when he had accomplished his work with the Treasury Dept., Rev. Hill threw himself into researching cancer and - at that time - revolutionary ideas about diet-related preventatives and cures to the disease. He lost his wife, Grace to cancer, and years later, he remarried and lost his second wife to a different kind of cancer. He doggedly continued his research, making amazing strides in discovery, and was just about to be given grants for testing treatments for humans, when he himself fell to the disease just six short weeks before his death. His daughter is working hard to organize his research for publication. It is not an easy book to read, and the movie tells "our" story SO well. But I am glad that, especially where my family was involved, I own a copy of the book that should not have disappeared from the shelves.